A few days back, I had a conversation with a few friends about pricing their work - not necessarily quilts - and that prompted me to write this blog post. Until recently, I wasn't selling my major work. Smaller quilts, pouches, aprons were the ones I concentrated on and was happy with it. Now, I have started selling some of my major works. The first reaction I got from people was "Wow! Thats expensive!" or sometimes they never came back to me after I quoted a price - just never replied. A few told me that they loved my work but they could not afford it. A VERY FEW told me that yes, the price was justified but unfortunately at the given time they could not afford it. So let me start out by saying what all of them had in common. "Yes! My quilts are expensive!" And that is because I work hard on them. I ignore my family when I work. I set aside specific time everyday and go out of my house and work on my quilts. I also buy the best of the material. And if that means buying a spool for Rs 400 instead of the Rs 10 one - yes I do it. I even buy the best sewing machine needles! And more than everything else, my work is done from the heart. Every stitch is there for a purpose. For every 10 pieces of fabric there lies a piece that has been discarded because it "just did not look perfect". My work goes home with me in my head. I get up in the night some times with a head buzzing with ideas! When I exhibited my work recently. A lady approached me when my stall was packed full and asked me the price of a quilt. I told her it was Rs 8000. I realized that she genuinely had that question. Then I asked her, "Do you know what goes into making a quilt?" When she said she didn't, I explained to her the entire process of making that quilt. she stood there quietly. She just said "Wow! I did not know that"and went away. I was disappointed in loosing yet another customer. 20 minutes later she was back with the money and she bought that quilt! I was so happy. Today I will tell all of you who do not know what goes into making a quilt. First, its just an idea in my head. Like the White Rainbow quilt. I just knew I wanted to make a quilt for someone who cannot see it. This stage usually happens while having tea, in the shower or even while driving! Later that idea starts taking shape and I start my sketches. These take an awfully long time. You will find numerous notebooks with these sketches in my studio and my home! If i were to make every quilt I sketched, I would have over two thousand quilts by now! 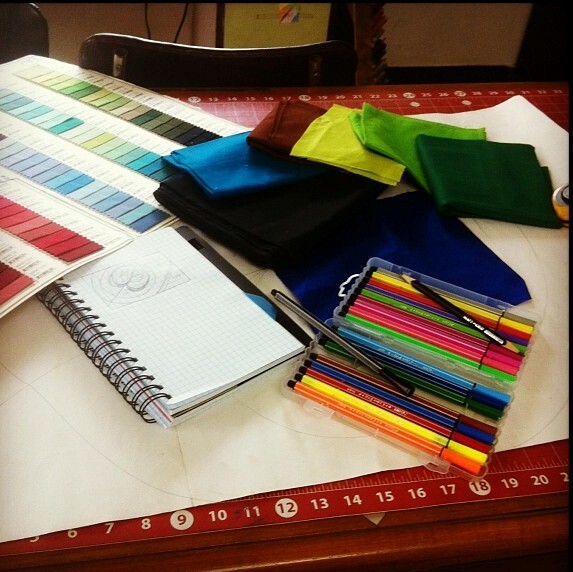 Then I start choosing my fabric. And this stage usually means a LOT of mess! I remove fabric from its shelf, pour out bins and then make decisions. This too takes a very long time. Then comes the actual cutting and sewing. Compared to the other stages, this stage usually lasts the shortest. Even when I make portraits, I spend more time over whether the piece is the right color than actually appliqueing it and sewing it down. And how do I calculate the price? The most important question is how much should be my labor charge. This is a decision that entirely up to you! What is your time worth? In the US people charge about 10-15$ per hour. But lets be realistic, you're not going to get that in India. So ask yourselves a few questions. How much does your hair stylist charge you for a haircut? She spends maybe about 20-30 mins on your hair and charges you anywhere between Rs 200 - 600 depending on where the parlour is, right? Aren't you even half as talented as her? So why dont you give yourself Rs 150 per hour? Now consider your rent, light & phone bill, stationary, electricity and all the other overheads! Consider them even if you are not paying them at the moment. Because if you do not consider it now when your business grows and you have to shift to new premises, your clients will have to bear the cost and they will grumble about the price hike! Is that your selling price? It is the Cost Price! 1. You own the place. You do not pay rent for the place where you make your stuff. If you do, the Rs 6000 is surely not going to take care of it! and B + profit = your retail price. This formula does not apply to custom work like Portraits. My portrait quilts might take shorter time, or use lesser material, but when it comes to pricing, they cost a lot! Because they are art and are custom made! If you are making quilts that are customized, you should always charge extra for making that unique piece just for the client. The best way to charge in this case would be to survey the market and see what others are selling similar work for. Depending on how better your work is compared to theirs you can then decide a price that you will be happy with. So now you know why my quilts are expensive. Do you also worry when you price your work? I hope my post is helpful to you. Just remember, if you do not value your work, nobody else will!!! Do tell me if it is!